The Masoud Farzaneh prize 2015 was awarded to Lasse Makkonen, VTT Technical Research Centre of Finland at a special ceremony held at the IWAIS conference in Uppsala July 1, 2015. Dr. Makkonen’s background is in geophysics, meteorology and ice research but his approach is multidisciplinary. He is best known for his work in modeling of icing of structures with applications to power lines, communication towers, ships and wind turbines. These models are applied worldwide in the design of structures. Makkonen has published more than 230 scientific papers, of which 70 are in international journals. He is also author of 11 patents. Lasse Makkonen’s present main interest is in microphysics of surface phenomena such as phase change, friction and adhesion. The applications include solidification processes in all scales, particularly as they relate to accretion of ice and snow. Another present interest of Makkonen’s is the theory of extreme value analysis and its application to evaluating structural safety and strength of materials. This years winner of the Masoud Farzaneh Award: Lasse Makkonen, Principal scientist at the VTT Technical Research Center of Finland (middle). Left Mustafa Fahmi, Vice-principal at the University of Québec at Chicoutimi and right Masoud Farazaneh, Professor in Electrical Engineering at University of Québec at Chicoutimi. The University of Quebec in Chicoutimi (UQAC) was represented at the ceremony by its Vice-Rector, Mr. Mustapha Fahmi. Masoud Farzaneh, Professor in Electrical Engineering at University of Québec at Chicoutimi, was also present. 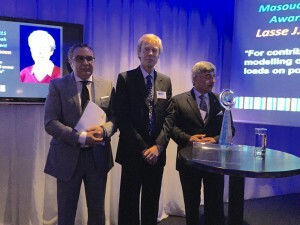 The Masoud Farzaneh Award was established in 2010 by Université du Québec à Chicoutimi (UQAC) in honour of Professor Masoud Farzaneh, an internationally renowned researcher in the field of power transmission and distribution in cold climate regions, whose contribution and impact made UQAC a world leader in this domain. This prize is awarded biannually, every odd year, to an individual for outstanding contributions related to the fields of power transmission and distribution, and high voltage engineering. Priority will be given to a researcher whose contribution takes into account the effects of atmospheric icing. In the evaluation process, the following criteria are considered: importance and impact of research, originality, leadership, publications and quality of the nomination. In Sweden there are some 70 000 surface heating systems, most of them small. By using a smart control system large energy saving are possible. 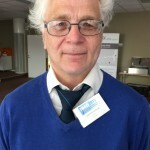 The energy consumption in the Swedish surface heating systems is 3-5 times higher than necessary, according to Rolf Westerlund, SEO for HoloOptics International AB. – Sometimes the owners forget about the system and it stays on all year round, he says. – Other times a poor control system waste a lot of energy because the heating is on at times it’s not needed. Surface heating systems are often used to stop icicles from forming on the roof of houses. The situation is aggravated by the lack of maintenance. To reduce the energy consumption better, more sophisticated control systems is needed. – Unfortunately these are more expensive and require more maintenance. Therefore it is difficult to mount these everywhere, says Rolf Westerlund. But now Rolf Westerlund and his company has an idea: A system of control centrals in a region sending wireless signal to subscribes to start and stop the heating. The control central would be situated high to give an early indication and beyond vandalism and spray from vehicles etc. The technology won the Green Innovation Contest 2014. – At the moment we’re looking for capital to be able to start a test phase, says Westerlund. 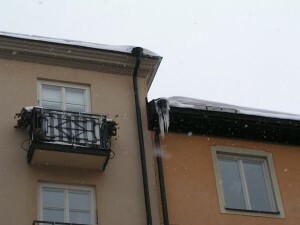 The surface heating systems are often situated in the ground outside entrances or in downpipes. The size may vary between some 10 m2 up to several 1 000 m2. Smaller systems normally use direct electric heating and the larger uses district heating. Installed capacity is between 100 and 300 W/m2. The energy consumption is dependent on many factors, including the meteorological conditions and the performance of the control system.